Depression is not the same as feeling downhearted or sad. We all get seriously fed up or feel in a really down mood from time to time. That’s not depression; that’s life. However, sometimes those low moods won’t go away and we don’t bounce back. If those low moods start to seriously affect our lives, to cause us to behave noticeably differently, to interfere with our usual day-to-day functioning, then that’s when psychologists start to consider that we might be suffering from clinically significant depression. Depression is a very common psychological disorder. Probably about one in four of the UK population develop worrying levels of depression at some time or other in their lives. It’s very likely that about one in ten of the people sitting in your local GP’s waiting room today are taking anti-depressants. There are very few people who have not either been depressed themselves or who do not have a family member or a close friend who has been so afflicted. However, depression is all too often a ‘secret illness’ and its sufferers don’t like to let other people know about their condition. That’s because, even today, mental ill-health still carries a social stigma. 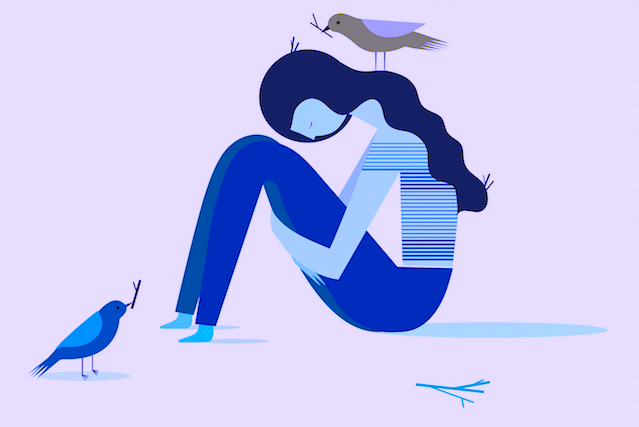 So what causes depression and what should sufferers do about it? Depression in its clinical sense usually arises when life’s problems overwhelm us. What these problems are, and how they affect us will vary from person to person. They don’t have to be huge, ‘blockbuster’ worries. A lot of little things, occurring over a long time can be just as depressing as some serious, one-off, blows to our way of being. Some theorists wonder if depression has a genetic component. Put simply, some people think that’s just how you are made. Other theorists wonder if depression has a nurturing component. In other words, are you feeling low because, in your experience, life is pretty naff. Lots of different psychotherapeutic theorists have lots of different, (and competing views), about the causes of depression. They also have lots of views about the best ways to treat depression. However, most practitioners would agree that the core component of depression is Anhedonia. This is an emotional state in which the sufferer generally loses interest in life, has little motivation, feels the future is hopeless, and is usually unable to experience pleasure. Such a person is generally emotionally flat. Nevertheless, whatever, the cause, people with depression need help. So, what can be done for them? What can they expect from the mental health professionals? In the UK the generally accepted approach to depression is to deliver treatment in a number of steps. 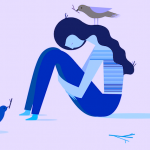 Step 1 – mild depression – is generally best treated by doing nothing. Left alone, most mildly depressed patients spontaneously recover within six months. In these sorts of cases therapists must be careful not to ‘over-therapise’ because doing so might well make things worse. However, basic-level supportive counselling can sometimes help with the healing process. It can also be the case that elementary CBT might prove useful to such sufferers. This usually involves something easy like providing patients with some basic information about their condition and teaching them some simple steps that they can take to help themselves. Step 2 – mild to moderate depression – this is usually more actively treated. Doctors will usually prescribe an antidepressant and psychotherapists normally offer more detailed and more intensive psychotherapeutic interventions and CBT treatments. For most people a treatment plan that combines pills, talking, and self-management skills training is generally the most productive way forward. Step 3 – severe depression – requires a more intensive approach, both from the medics and the therapists. A referral to a psychiatrist or the local Community Mental Health Team is usually indicated. At this stage, adopting a more powerful medication regime might be necessary. Again, psychotherapy is an important part of the overall treatment plan, even in cases serious enough to require hospitalisation. So there you have it, depression is common, it can be crippling but it does not have to rule your life. If it strikes, don’t suffer in silence – get help – it works.